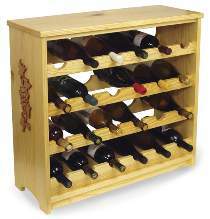 This simple to build wine rack holds 24 bottles! Compact design is large enough to stand alone on the floor yet small enough to fit on a countertop. Make it from "1x12" oak or pine boards, no edge gluing required. The beautiful segmented grape vine decorations on each side can be cut from 1/4" x 3" x 12" pieces of stock. Patterns drawn FULL SIZE. Measures 27"H x 29"W x 11"D. Order two 1/4" pieces of either oak or pine separately below.